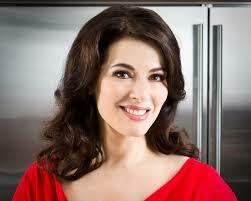 How about some Spring Chicken from the famous chef Nigella Lawson? Heat the oil in a large, wide casserole that comes with a lid (and can be taken to the table) and add the pancetta cubes (or lardons or bacon), cooking them until they begin to give off their juices and start to colour. Add the chicken thighs (skin-side down if yours have skin), tossing the pancetta cubes on top of the meat (to stop the pancetta burning and to make space) as you put the poultry in the pan, and cook for about 5 minutes over a medium heat. Turn the thighs over and tip in the prepared leek, celery and garlic. Season with the dried tarragon, salt and pepper, then stir everything around a bit, letting it cook for another 5 minutes. Pour in the cider, then sprinkle in the frozen peas. Bring the pan to a boil then cover, turn down to a very gentle heat and cook for 40 minutes. Do check after 30, though, to see if the chicken is cooked through, and if you are disobeying me and going boneless, then 20 minutes should do it. Remove the lid, stir in the mustard, and then toss the shredded lettuce over the chicken, letting it wilt in the hot sauce for a couple of minutes. 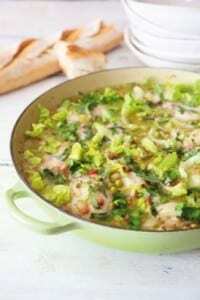 Scatter the chopped tarragon over the casserole and take the steamily fragrant pot to the table with quiet pride. The chicken, without lettuce, can be cooked 1 day ahead. Transfer to non-metallic bowl, then cool, cover and refrigerate as quickly as possible. To reheat, return to casserole dish, cover and reheat gently, for around 20 minutes, until chicken is piping hot all way through. Add a little water or chicken stock if pan becomes too dry. Add the lettuce and continue as directed in recipe. Cook and cool the chicken as above, then freeze in airtight container for up to 3 months. Defrost overnight in fridge and reheat as above. With spring coming and the weather slowly starting to warm up, do you need a recipe that the whole family will enjoy? In a large bowl, whisk together the soy sauce, honey, pepper, garlic and oil. 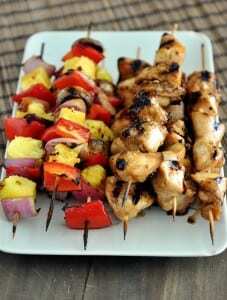 Measure out 1/4 cup marinade and place in a covered container in the refrigerator to use for grilling. Place the cubed chicken in a large ziploc bag and the vegetables in another ziploc bag. Pour half of the remaining marinade over the chicken and the other half over the vegetables. Seal the bags and refrigerate for at least 2 hours (can be refrigerated up to 24 hours). Preheat a grill to medium heat and grill the skewers, flipping every couple of minutes, until the chicken is cooked through (about 7-10 minutes total, depending on the heat of your grill and size of the chicken pieces). The vegetable skewers only need a few minutes per side. Use the reserved marinade to brush over the chicken and veggies during the final minutes of cooking. Serve immediately.